Modern-day slavery in Florida agriculture cannot be understood in a vacuum. It is not separate from the past, rather its roots extend deep in the state's history. While the phenomenon of forced labor has taken many forms over the past four centuries in Florida agriculture, the industry has never been entirely free of the scourge of slavery. Though the extent of slavery in Florida agriculture has diminished over the centuries, one thing has remained constant: farmworkers have always been, and remain today, the state's poorest, least powerful workers. If we are to abolish slavery once and for all in Florida agriculture, we must pull it up from the roots by addressing farmworker poverty and powerlessness. The CIW's Campaign for Fair Food is designed to attack slavery at its roots -- to address the poverty and powerlessness that make farm labor slavery possible today. The campaign identifies the links between the brutal farm labor conditions in US fields and the retail food giants that buy the produce grown in those fields. The high degree of consolidation in the food industry today means that multi-billion dollar brands on the retail end of the industry not only profit from farmworker exploitation, but actually play an active role in that exploitation by leveraging their volume purchasing power to demand ever-lower prices. 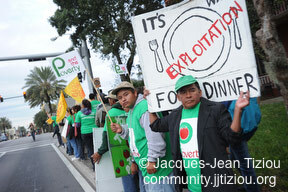 Lower produce prices in turn create downward pressure on farmworker wages. The Campaign for Fair Food seeks to reverse that process, enlisting the resources of retail food giants to improve farmworker wages and harnessing their demand to reward growers who respect their workers' rights. Specifically, through its “Fair Food” agreements [as of February, 2010, the CIW has reached agreements with seven of the world's largest retail food companies] the CIW is raising the tomato harvesting wage floor, establishing a voice for farmworkers in the agricultural industry, and enforcing the first-ever market consequences for growers that use forced labor. The power of this model was demonstrated in 2009 following sentencing in the case of U.S. vs. Navarrete. For the first time ever, a federal slavery conviction led to direct market consequences for the growers associated with the case, triggering the zero tolerance for slavery provisions in the CIW’s agreements which caused the growers to lose business. A more chilling expression of indifference is hard to imagine. Of course, there can be no “fair market price” for slavery, and there will be no end to modern-day slavery until companies like Publix stop turning a blind eye to human rights abuses in their suppliers' fields. That is why this March and April we will be taking the movement to end farm labor slavery ever more forcefully to consumers here in Florida and across the nation. Throughout the month of March, we will be touring the state with a "Mobile Modern-day Slavery Museum." The museum will be a mobile educational vehicle in the form of a box-truck outfitted as a replica of the trucks involved in the latest slavery prosecution and accompanied by educational displays on modern-day slavery in Florida, its roots, the reasons it continues today, and its solutions. The exhibits will be developed in consultation with leading academic authorities on slavery and labor history in Florida and will be a rigorous examination of the continuous history of slavery in Florida from its settlement to the current day.Then, from April 16-18th, farmworkers from Immokalee and their allies will take the movement to eradicate slavery to the streets on a three-day march from Tampa to Lakeland, Florida, home of Publix's corporate headquarters. They will march with the museum in tow and behind a banner calling on Publix to support three fundamental "Farmworker Freedoms:"
Please join us this spring as we embark on two powerful months of education and action designed to end farm labor slavery in Florida. We can't change the fact that slavery has been with us throughout Florida's history, but with your help, we can make certain that it is not part of our future. 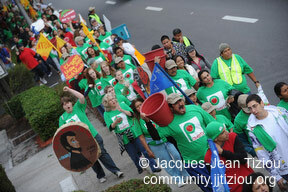 For more information contact us at march@ciw-online.org.